Mansfield boss David Flitcroft says extra work has been done this week with the aim of making the Stags a more potent attacking unit. Flitcroft cited last weekend's defeat to Exeter as his main driving force behind fielding a very strong line-up in a 5-1 victory at Doncaster on Tuesday in a reserve team game. And he hopes to now see the continued work pay off when Mansfield travel to Cambridge United on Saturday. He said: “We’d looked at the work we’d done up front on Saturday and had around 30 entries into the last third but with a really poor end product. “When we’d reviewed it we decided it wasn’t right such was the lack of quality, end product, responsibility and factors like the final ball and picking players out. Saturday's opponents Cambridge are just three points behind Stags in the early standings, but Flitcroft says it's been hard to ascertain teams' true form such is the unpredictable nature of the league. 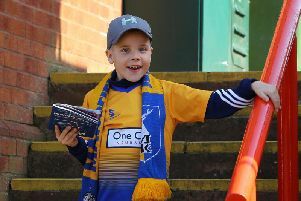 He said: “When you look at Leagues One and Two they’re both such unpredictable leagues – you’ve got Newport flying at the top of the league but then Yeovil absolutely demolished them. There have been some real surprise results and I don’t think the form has settled down yet and that unpredictable stage remains. “Any League Two team has threats but we’ll try and take advantage of the work put in this week and also aim to put right the things we got wrong on Saturday and we’ve been working hard to do that. “We’ve got to start putting more points on the board because it’s alright the performances being good and the level of play being of good quality but the responsibility of scoring goals and not conceding them lies with me and we have to get that right come Saturday. “I’m seeing a group of players that are prepared to stay behind, get to the training ground early and commit to what we’re doing. Flitcroft added that he hopes to have striker Craig Davies back involved one way or another on Saturday after a hamstring njury, commenting: “With any hamstring injury, you don’t want it to get worse. He’s been in the gym and we’ll get him out on the grass by the end of the week and get his running and movement going to see how it reacts.